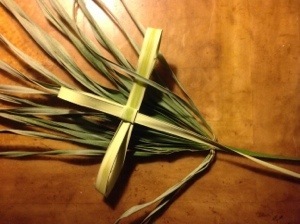 I was sitting at my kitchen table today, making a cross out of the palm branch that I had earlier carried as a parade flag around my church during the litany of the palms. I folded and tucked one end of the palm branch, watching it transform from waving wand lifting shouts of hosanna to the symbol of crucifixion. My act involved nothing other than folding, turning, and tucking the same object in different ways. The palm’s substance never changed, but its symbolism did. As I formed the shape of the cross, I felt happiness and heartbreak weaving together in every turn. This is the way of this day: Palm Sunday, the Sunday of the Passion. The day that the shouting of the crowd turned from Hosanna! to Crucify Him! Did the substance change? Did the crowds change? Did we change? Maybe the story isn’t as much about the changes we think we see as it is about the deeper recognition that happiness and heartbreak are often woven together in this journey. As I listened to the Gospel narrative today, I could hear these themes intertwining at every turn, just like my palm cross. Happiness and heartbreak are in the words of Jesus, in the narrated gospels that historically tie together the ancient prophesies with the stories of early Christians, in the disciples and in the crowd. I could hear the voices in my own head wanting to leap past the disbelief and betrayal, to imagine myself staying awake to pray with Jesus in the Garden at Gethsemane instead of falling asleep on the job. But, I would probably be heartbroken at my own ineptitude. My happiness at being a follower of the justice-bearer and healing teacher would at every turn be a heartbreak of trying to keep awake but finding myself bleary-eyed and tired; my commitment to act faithfully and not let others down would give me joy until I realized time and time again that I screwed it up somewhere. The rooster would crow, and I would be the one smacking my head and realizing that once again, I had fallen short. Even if I managed my way through the crowd, and I stuck by the One in whom I believed, I would find myself looking up at a bleeding, dying beloved who was crying out in that very real, poignant, human experience of feeling betrayed and forsaken. Maybe the real lesson in Palm Sunday isn’t about change after all. Tonight, I am considering that it might be about changelessness. We are not loved less for falling asleep on the job, or for betraying, or mocking, or fleeing, or denying. The message today is a resounding, unchanging love that is present in and surrounds each and every person. That love encompasses all our heartache and all our happiness. Jesus…at the center of this story…knows us. The heartache and happiness he exhibits tells me something about my own humanness, about the own character of my conundrums of feelings and my vacillating beliefs. Instead of condemnation, there is a great love, and a deep understanding. This is the changeless substance of divine love, even when bent and folded into its many human forms of expression. Holy Week is happiness and heartbreak for me. Some of my most enduring human losses and challenges have been during Holy Week. So have some of my most transformative moments of faith and growth. I carry happiness and heartbreak in my soul, and they both are life-affirming to me because they remind me of my own truest, core self. This Palm Sunday, I consider the fact that this core self reflects the place where we are most known, and loved, and cherished by God. The shadows and the sunlight, the heartbreak and the happiness. All these we carry on the journey…a journey on which we are never alone. This entry was posted in Lent 2014 and tagged Christianity, cross, faith, Jesus, palm cross, palm sunday, Passion Sunday, reflection. Bookmark the permalink.